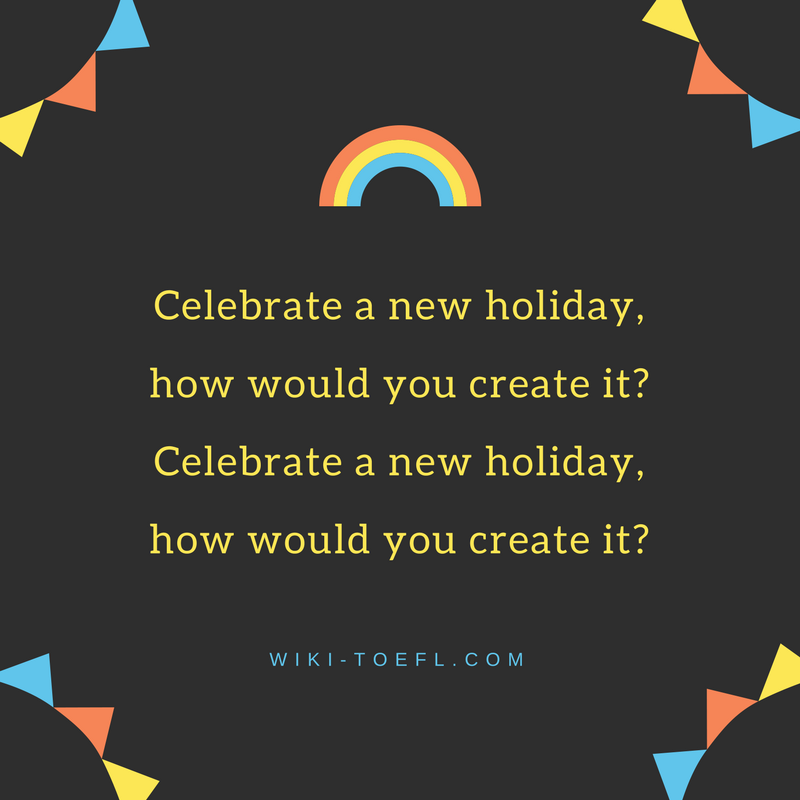 Toefl writing topic: Celebrate a new holiday, how would you create it? Home Writing	Toefl writing topic: Celebrate a new holiday, how would you create it? Topic: Which should your school purchase – computers or books? October 24 is Union Nations Day. This day is noted in the calendars, but not observed as a holiday around the world. I want the entire world to celebrate the birth of the United Nations because of its attempts to promote peace, education, and health around the world. Peace is the most important thing that we can have today. The sooner that we can stop war the sooner we can all have better lives. There are countries around the world that have been at war for generations. In some of these countries, UN Peacekeepers have temporarily stopped the violence so people can go about their lives. If this peace could be made lasting, the lives of these citizens would be much richer. The UN actively works to promote education. Universal literacy is one of its important goals. Every child in the world deserves to know how to read and write. The UN is also involved in job training for adults. The age of information technology demands new job skills. The UN works with continuing education programs around the world so workers are not left out of the job market. The UN has played an instrumental role in the eradication of smallpox. Polio vaccines and AIDS-awareness programs have also helped reduce the incidence of these diseases. There is a lot to be done in these areas. Much of the work of the UN is unknown and underappreciated. If we want to live in a peaceful world, where every child can attend school and where every citizen has access to health care, we need to support the work of the UN. We need to recognize its importance and celebrate its birthday.